The Q Source Resource recently told you about American Hakko Products' (Hakko) new FM-2030 Heavy-Duty Soldering Iron for use with the Hakko FM-203 Dual-Port Soldering Station and FM-206 High-Performance 3-Port Rework System. If you plan on using the FM-2030 with the FM-203, you may need to upgrade your station. 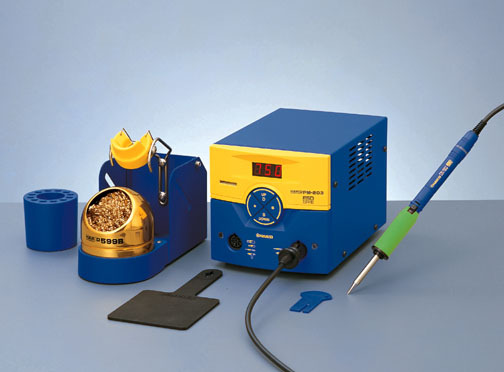 If you have a Hakko FM-203 Soldering Station with a serial number that is before 0220311002129 you'll need to purchase the FM203-UPGR upgrade. A Connector Error (C-E error) will appear on the display if you try to use the FM-2030 with an FM-203 that has not been upgraded. Any other firmware versions require the FM203-UPGR upgrade to use the FM-2030 Heavy-Duty Soldering Iron. The FM-203 must be shipped to the Hakko Service Center in Valencia, CA for an upgrade. Contact Hakko Customer Support at 661-294-0090 for a Return Material Authorization (RMA) number before returning the unit for upgrade. Check out the Hakko Store Department at QSource.com for a wide selection of Hakko products. You can also give our helpful experts a call (800-966-6020) or send us an email with your questions or product needs. Q Source is your Hakko Resource! O.C. White's "Awareness Pink" LED Magnifier & Breast Cancer Awareness…It's Not Too Late to Donate! We recently told you about a great product (O.C. White's "Awareness Pink" Green-Lite Rectangular LED Magnifier) and a great cause (The Breast Cancer Research Foundation (BCRF)). We wanted to remind you that Q Source, Inc. is donating $10 from the sale of each "Awareness Pink" Magnifier to the BCRF through November 30, 2011. So, National Breast Cancer Awareness Month may almost be over but you've got another whole month to help us donate to this important charity. 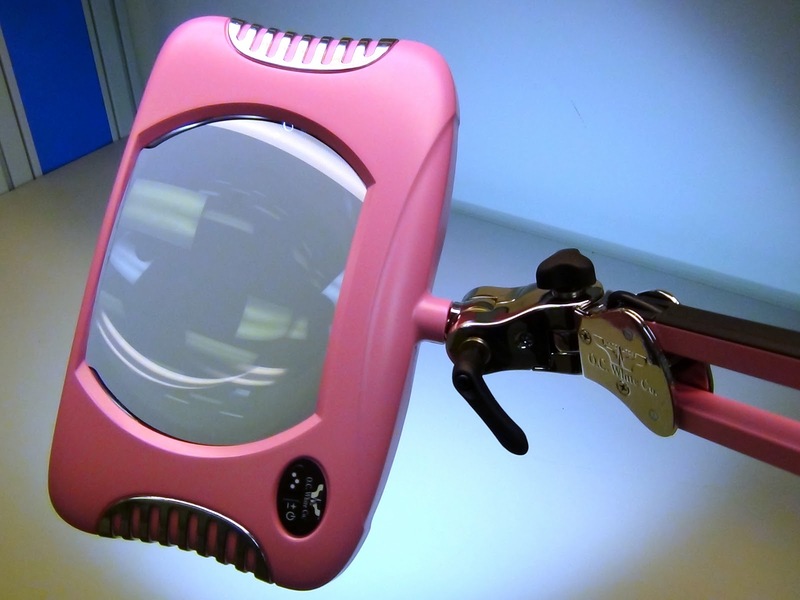 The "Awareness Pink" Green-Lite Rectangular LED Magnifier offers a long list of excellent features such as 2x (4 diopter) magnification, "next-generation" surface mount LEDs, ESD-safe reliability, and a strong, "Elite" arm for maximum holding power. To see the complete list of impressive features, and for a closer look at the magnifier, please read our previous blog and view our "Awareness Pink" Flickr photos and YouTube video. The Breast Cancer Research Foundation works to bring about a cure for breast cancer in our lifetime. 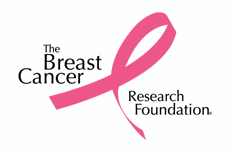 They provide funding for innovative research and education about good breast health. To purchase the "Awareness Pink" Green-Lite Rectangular LED Magnifier (Model #: 82400-4-Pink; Q Source #: O003-000297), visit the O.C. White Green-Lite Store at QSource.com, or give us a call at 800-966-6020. When you buy your "Awareness Pink" Green-Lite through Q Source, we will make the $10 donation directly to the BCRF (you can also make a personal donation via the link on our Web site). We thank you for your interest in Q Source and your support of breast cancer awareness. And, remember, it's not too late to donate! We'll dispense with the suspense and let you know that QSource.com now offers Jensen Global dispensing products. We're not needling you about our wide selection of industrial dispensing needles, dispensing syringes, squeeze bottles, and other accessories. 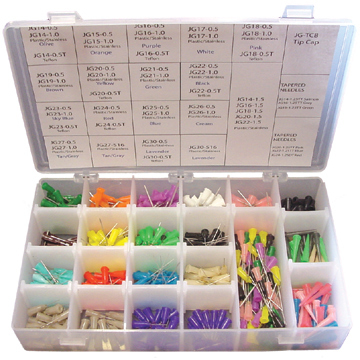 Jensen Global dispensing needles are available in a variety of colors and sizes. Jensen Global's products serve a variety of industries including: electronics, industrial, aerospace, life sciences, arts & crafts, hobby, and automotive. With an extensive choice of sizes and colors, QSource.com offers a variety of Jensen Global dispensing products such as the Jensen Global JG16-0.5X Economical 16-Gauge Needle, the Jensen Global JG30A-20 30cc Air Syringe & PE Stopper, and the Jensen Global JG1.0BC-B 1 oz. Bottle & Luer Lock Cap. Stop by the Jensen Global page on QSource.com to check out our offerings of dispensing solutions. And remember, if you can’t find it on our Web site just give us a call (800-966-6020) or email us and we'll get you what you need. 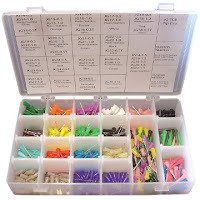 Jensen Global has more than 20 years experience in the dispensing industry and offers an extensive inventory of dispensing supplies and solutions to meet any application. They are headquartered in Santa Barbara, CA. In between helping visitors to the Q Source booth, some of the Q Crew have been snapping pics with their cell phones at INTERPHEX Puerto Rico and we wanted to share them with you. Day 1 is almost over but we're already looking forward to tomorrow. Hope to see you there! The availability of the new Hakko FM-2030 Heavy Duty Soldering Iron was one of three product-related announcements made by American Hakko Products (Hakko) recently. An extended reach version of the Hakko T15-D32 Tip and the discontinuation of the Hakko 999-137 Combo/HEPA Filter rounded out the announcements. The Hakko FM-2030 is a new soldering iron handpiece only compatible with the Hakko FM-203 Soldering Station and FM-206 High Performance 3-port Rework System (if attached to anything other than the FM-203 D port or FM-206 CH2/CH3 ports, a grip error or connector error will occur). Ideal for challenging soldering applications (such as heavy ground planes or high heat sink tasks), the FM-2030 features a higher mass tip offering twice the power of regular T15 tips (the FM-2030 uses T22 Series tips). Note: Please contact Hakko for the FM203-UPGR upgrade, which allows FM-203 stations with serial numbers before 0220311002129 to function with the FM-2030. 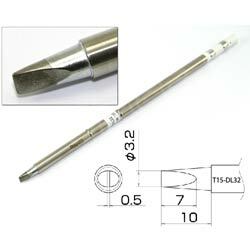 Similarly shaped as the T15-D32, the Hakko T15-DL32 Tip has a reach that has been extended from 5 mm to 10 mm. The two opposing tip facets have been stretched from 1.6 mm to 7 mm. 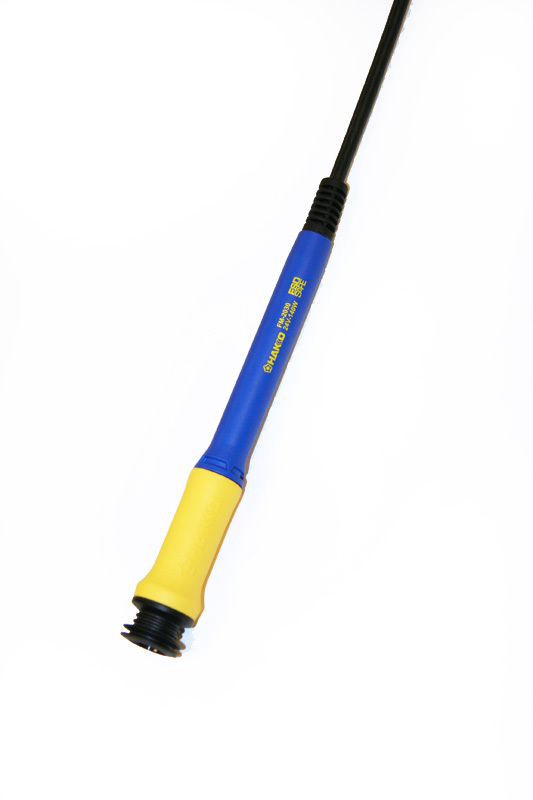 The Hakko T15-DL32 Tip is now a standard stocking tip for the North American market. Hakko's 999-137 Combo/HEPA Filter is the latest HJ3100-related product to be discontinued. The new A1586 Main Filter replaces the 999-137 and when used in the HJ3100 it will maintain filtering efficiency and increase airflow performance. For maximum performance, use the A1585 Pre-Filter in combination with the A1586. Although comparably constructed, use of the A1586 Main Filter in the HJ3100 requires the Hakko Filter Adapter Frame (999-241). As previously mentioned, the 999-241 is FREE from American Hakko. 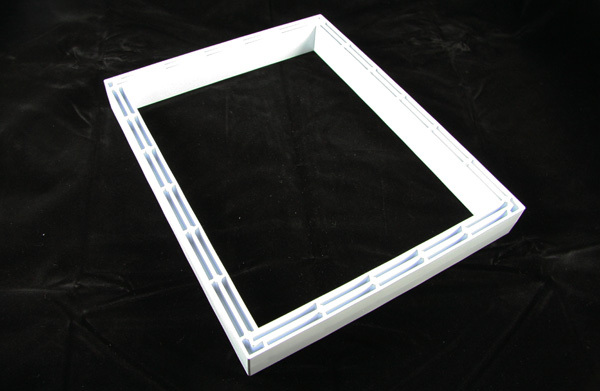 Visit http://www.hakkousa.com/forms/adapter for more information or to request your FREE Filter Adapter Frame. For more information about any of these products, please visit QSource.com or give us a call at 800-966-6020 and one of our experts will help you find the solutions you need. 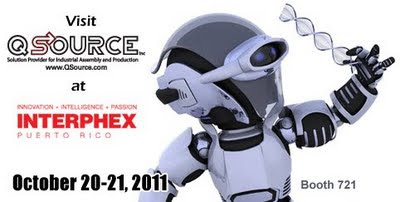 Q Source is eagerly awaiting next week's INTERPHEX Puerto Rico 2011 Trade Show. INTERPHEX Puerto Rico is a two-day event (October 20-21, 2011) focused on the complete range of life sciences manufacturing: Biotechnology, Diagnostics, Medical Devices, and Pharmaceuticals. Touted as the Caribbean's premier event, the INTERPHEX show educates through conference sessions and training courses, provides valuable information, and creates networking opportunities, while also aiming to help companies improve their bottom line, increase efficiency and productivity, and grow their competitive advantage. This year's conference sessions will follow three dynamic tracks: Facilities and Staff Optimization, Scientific Engineering & Technology, and Regulatory QA/QC. New training courses will include: ENERGY STAR Training by Juan Gutierrez, MPA, Environmental Protection Specialist, EPA, and Increase Tablet Press Uptime by Reducing Changeover Downtime by John Henry, Changeover Wizard, Changeover.com. Q Source's exhibition will feature our new, completely redesigned, full-size display booth. The booth features a modern, updated theme with a video display showing original informational/vendor-related videos, vendor literature, and an array of quick response (QR) codes for easy access to everything Q Source. Visitors will be able to simply walk up to our booth, scan the appropriate QR code with their smartphones, and be automatically connected to a variety of Q Source-related information. For more information about Q Source and the INTERPHEX Puerto Rico 2011 Trade Show, please check out our Facebook event page. And don't forget to stop by and visit Q Source at Booth 721. Brady Worldwide (Brady) announced recently a significant upgrade to their LabelMark Labeling Software. 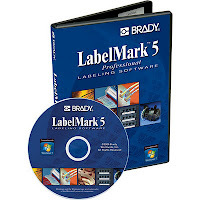 The release of LabelMark 5.4 (LM5.4) sees several new features and enhancements added and addresses a few issues with bug fixes. The Standard Edition of LM5.4 includes such new features and updates as: new options when choosing pre-printed supply types, an updated interface when printing ranges of labels, font size buttons added to the text properties toolbar, choices for default zoom factors in the application defaults, a vertical alignment update, easier sticky text tool usage, changes to the edit 110 block layout can now be made in the editor, and user-created custom SQL queries. The Pro Edition includes all of the enhancements of the Standard Edition plus a new DataComm Wizard, which helps the user design labels for specific manufacturers' data communication panels and also allows for custom products to be created if the manufacturer is not already listed in the wizard. The 5.4 release also contains the following bug fixes: when importing data to rotated objects the top left corner now stays consistent from label to label, the split legacy text object addresses issues when opening LabelMark 3 and 4 files, THT-19-430 and THT-17-430 have been added to the parts database, legacy files will now open, the M71EP-176-593 part definition has been fixed, custom continuous part for IP Printer now available, skipping of PS-125-2 labels during print has been fixed, transferring a license now works even if the new machine and old machine have different clock settings, a problem with importing using the autofit wiremark templates has been fixed, an update to font size change notifications, and a fix to BPT part definitions to ensure proper printing on the BBP11 printer. Please follow the link for more information about the Brady LabelMark 5.4 release. To place an order for the LM5.4 software please call Q Source at 800-966-6020. 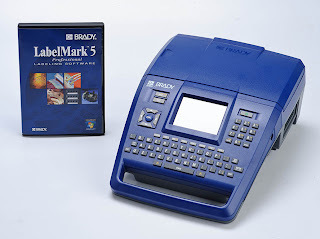 We also offer the LabelMark software bundled with Brady's excellent BMP71 Portable Label Printer. We hope we're "wetting" your appetite with this announcement…QSource.com now offers a large selection of Weller® soldering/desoldering/ rework tools and accessories. Come check out Weller's innovative solutions for soldering. You won't be in a state of "flux" when it comes to finding the right Weller soldering solution. 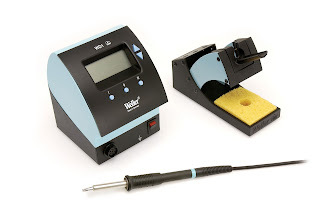 QSource.com has the right tools for most any application, including: the Weller WD1002 Digital Soldering Station, the Weller WD2000M Dual Micro Digital Rework Station, and the Weller WSA350 Benchtop Smoke Absorber. 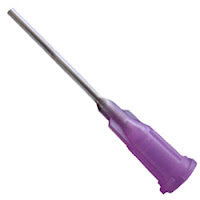 Visit the Weller page on QSource.com to browse our selection of soldering/desoldering tools and accessories. If you don’t see the parts you need just give us a call (800-966-6020) or send us an email and our helpful experts will get it for you. Weller has more than 50 years of expert experience in the professional soldering industry and is now a part of the Apex Tool Group. Apex’ offices are located in Sparks, MD. QSource.com is now offering Erem® Swiss-made, precision-engineered cutters, tweezers, and pliers. Erem's high-reputation tools combine operator comfort, ease of use, and the benefit of more than 40 years of research and development. QSource's selection of quality Erem tools is perfect for a range of applications such as medical device manufacturing, electronics, telecommunications, aviation/aerospace, the watch industry, and biology. Our choices of these precision, Swiss-made tweezers, cutters, and pliers include: the Erem 776E Diagonal Super Flush Cutters, the Erem EOOSA Ergonomic Fine-Point Tweezers, and the Erem 544 Chain Nose Pliers. Visit the Erem page on QSource.com to check out our offerings of Erem precision-made cutters, tweezers, and pliers. If we don't have the exact tool you need just give us a call (800-966-6020) or email us and our helpful experts will get it for you. Erem is an Apex Tool Group brand. Apex' offices are located in Sparks, MD. The Xcelite® brand of quality hand tools, popular with the electronics service industry, is now available at QSource.com. 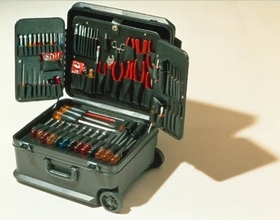 Our selection of these industry-known, precision tools includes tool kits, nutdrivers, cutters, and pliers. Favorites of electronics technicians for 90 years, Xcelite's high-quality, precision hand tools can meet the needs of most tasks. QSource.com's offerings include deluxe tool kits like the Xcelite TCMB100STW Black Attaché Tool Case w/Wheels & Tools (contains 53 individual hand tools, 31 Series 99® interchangeable screwdriver/nutdriver blades and handles, and two specialized screwdriver/nutdriver kits), versatile quick-change tool sets like the Xcelite 99SMX 23-Piece Series 99® Service Roll Kit w/Plastic Case (contains four screwdrivers, 12 nutdrivers, two pliers/cutters, and five other tools), and individual tools like the Xcelite 10MM Metric Nutdriver w/Drilled Shaft. Visit the Xcelite page on QSource.com to check out our variety of hand tool solutions. If we don't have the exact tool you're looking for just give us a call (800-966-6020) or email us and our helpful experts will help you find it. Xcelite is a Cooper Hand Tools brand in the Apex Tool Group. Apex' offices are located in Sparks, MD. As mentioned in our previous blog article, Q Source will be donating $10 from the sale of every O.C. White 82400-4-Pink "Awareness Pink" Green-Lite™ Rectangular LED Magnifier to The Breast Cancer Research Foundation (BCRF). To learn more about this, and the entire Green-Lite line of ESD-safe LED magnifiers, please check out our latest "On the Bench" video.